When Paul Canoville took to the pitch for Chelsea in 1982, he was prepared for abuse. When the monkey chanting and the banana throwing started, he wasn't surprised. He wasn't prepared, however, for the abuse to be coming from his own side. Canoville was the only member of the team whose name was booed instead of cheered, the only player whose kit wasn't sponsored. He received razor blades in the post. He took to waiting two or three hours to leave the ground after a match, fearing for his safety. So minimal was the presence of black players in the game, the few who managed to break through were subjected to the most graphic abuse from all sides. Today, 30 per cent of English professional footballers are black, and amongst their number are some of the biggest heroes of the beautiful game. But just how far have we come? With unprecedented access to current and former players ranging from Viv Anderson to Cyrille Regis to John Barnes, Emy Onuora charts the revolutionary changes that have taken place both on and off the pitch, and argues that the battleground has shifted from the stands to the board room. In this fascinating new book, Onuora critically scrutinises the attitudes of FIFA, the FA and the media over the last half-century, and asks what is being done to combat the subtler forms of racism that undeniably persist even today. 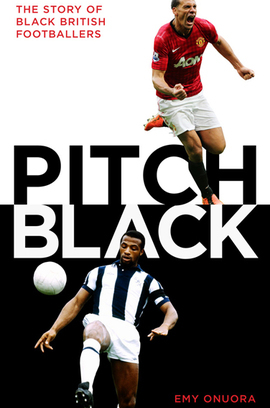 Featuring startling revelations from all levels of the footballing fraternity, Pitch Black takes a frank and controversial look at the history of the world's most popular sport – and its future.